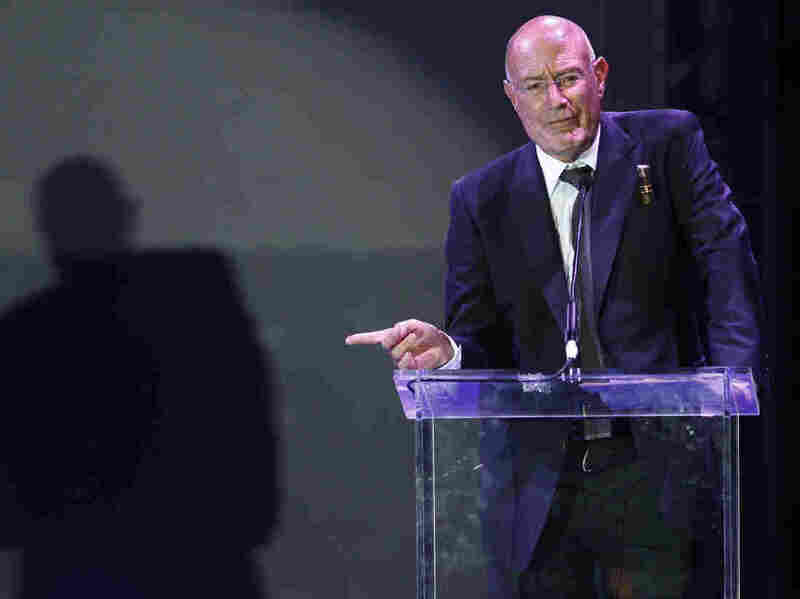 Netanyahu Lobbied The U.S. For 'Fight Club' Producer Milchan But Denies Bribes : Parallels Israeli police recommended the prime minister be charged with allegedly accepting expensive gifts for favors from billionaires including Hollywood producer Arnon Milchan. Movie producer Arnon Milchan accepts the Legacy of Citizens Lifetime Achievement award at an event celebrating the 60th anniversary of the state of Israel in Los Angeles on Sept. 18, 2008. Israeli police believe billionaire Hollywood producer Arnon Milchan bribed Israeli Prime Minister Benjamin Netanyahu with expensive cigars and pink champagne in exchange for a series of favors, among other corruption allegations police unveiled this week. Netanyahu denied he did Milchan a single favor — except for one. Milchan, whose scores of film credits include Pretty Woman, L.A. Confidential and Fight Club, is an Israeli citizen residing in the United States on a visa. Several years ago, U.S. officials rejected his request for a renewed visa, and Netanyahu lobbied U.S. officials including then-Secretary of State John Kerry to issue it. "Why was it revoked from him? Because very important things were published in the press about what he did in the past on behalf of Israel," Netanyahu said in a televised address to the Israeli nation. An individual connected to the case, speaking on condition of anonymity to discuss a sensitive matter, said U.S. consular officials raised concern after Milchan gave a tell-all interview in 2013 to the Israeli documentary program Uvda — the equivalent of 60 Minutes — claiming he used to work in the United States as an Israeli secret agent and arms dealer decades ago. U.S. officials can deny entry visas to people found to have conducted activities in the United States as secret agents of a foreign country, and the U.S. has reportedly done so with cases involving Israelis. Milchan described it as being given permission to be James Bond. The program Uvda described him as a man who dreamed of making movies — and acted out one of his own. Milchan claimed he was recruited in the 1960s by Shimon Peres, the late Israeli leader, who was a defense official at the time, and worked to procure technology for Israel's nuclear program. He reportedly smuggled 800 nuclear triggers from California to Israel from 1979 to 1983 without a proper license. Milchan did not immediately answer a request for comment. In 2014, Netanyahu allegedly lobbied officials including former U.S. Ambassador to Israel Daniel Shapiro as well as Kerry about Milchan's visa, according to Israeli media. The State Department eventually approved his visa renewal. Israeli police says that Netanyahu did so in return for thousands of dollars worth of gifts they alleged Milchan gave Netanyahu over the course of nearly a decade. Police argue that Milchan stood to win significant financial gains by getting the U.S. visa. Netanyahu denied foul play but acknowledged lobbying for a man he said was a deserving citizen. "How can you claim that for cigars I acted with the Americans to return his visa which was revoked from him?" Netanyahu said in his televised address. "The basic obligation of every prime minister in Israel is to help whomever has been harmed as a result of special service done on behalf of Israel." He argued that Shimon Peres also acted on Milchan's behalf when he lobbied to prevent a lawsuit in the U.S. against Milchan for his activities as a secret Israeli agent. Was it improper for Netanyahu as a head of state to press the U.S. on the matter? The person connected to the case said it was "unusual" and "unique" for the prime minister to intervene personally on behalf of a private citizen regarding a visa. A former State Department official said it is not standard practice for officials to lobby each other on visas, but it is also not unheard of for a world leader to take a personal interest in a specific visa case. It can often tip the balance. "Sometimes a person may be ineligible for a visa, but eligible for a case-by-case waiver, and leadership might say they'd like the person to get that waiver," the official said, commenting on condition of anonymity to discuss the consular practice. NPR's Michele Kelemen contributed reporting.